Scuba diving regulators come in all shapes, sizes and functions. When a scuba diver thinks of reliability and ruggedness in a regulator, only the Sherwood Brute comes to mind. Walk into any Scuba shop and look at their rental regulators and most likely you will see the Brute as the workhouse rental regulator. The Brute regulator is an unbalanced system that is really basic is its design. Starting at the first stage, Sherwood incorporates its dry bleed technology that keeps the water out of the spring chamber. As the diver dives deeper, the water pressure increases. In traditional regulators this increased pressure is conveyed into the spring chamber by water. This water will eventually cause corrosion and wear on the internal spring. By using the dry bleed system, the increased water pressure results in an increase air pressure as the bleed system forces a tiny bit of air out a one way valve. The spring chamber stays dry and corrosion is reduced. Bottom line, this system works great. Over the period of an hour dive, the dry bleed system will equal about three or four breaths of expended air through the one way valve. The second stage is made of a heavy grade thermal plastic which is lighter than traditional second stages. Besides finding the Brute in rental shops around the world, you will also find it on bailout bottles and pony tanks. Just add a pony tank pressure gauge and a tank and bracket and you are all set. Read about Sherwood balanced regulators. 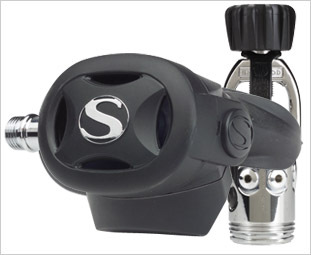 Sherwood Scuba Diving Regulator - unbalanced to Scuba Regulators overview.